Early diagnosis and rigid fixation of ipsilateral distal radius and Monteggia fractures in adults are mandatory for successful clinical outcome. Department of Orthopaedics, Spine and Trauma Unit, General Hospital of Patras, Greece. 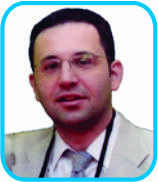 Dr. Ioannis Papaioannou, Pavlou Pavlopoulou 15, Aroi, Patras, 26331, Greece. Introduction: Monteggia lesion is a well-known injury that constitutes 0.7% of forearm fractures-dislocations. The combined presentation of Monteggia injury with ipsilateral distal radius fracture is an extremely rare lesion, especially in adults. Case Report: A 25-year-old woman fell from a chair, injuring her left forearm and wrist. On admission, plain roentgenograms of the left upper extremity revealed an anterior, Bado type-1 Monteggia fracture-dislocation associated with an ipsilateral distal radius fracture. The patient underwent surgical treatment of both injuries with a 3.5 limited contact dynamic compression plate for ulna and a 3.5 mm T-type buttress locking plate for distal radius. Intraoperative roentgenogram showed a spontaneous reduction of the ipsilateral dislocated radial head following osteosynthesis. An above, the elbow plaster cast was applied for 2 weeks because of the radial head dislocation. 10 weeks postoperatively the patient regained full range of motion of her wrist, elbow, and supination/pronation in her forearm. 4 months postoperatively she was returned to her previous daily activity after roentgenograms showed complete bone healing. Conclusion: In this rare case presentation with a review of the literature, we emphasize the mechanism of this lesion and we provide some risk factors for poor functional outcomes when treating such injuries. Both the review of the previous literature and our opinion support that rigid fixation of both fractures in such injuries is mandatory to achieve good functionality through early mobilization. Plain roentgenograms of the whole forearm including wrist and elbow are essential to avoid misdiagnosis. Keywords: Monteggia fracture, ipsilateral, distal radius fracture, adults, rigid plate fixation. Monteggia fracture is a rare injury, which includes fracture of the proximal ulna associated with ipsilateral radial head dislocation, and represents only 0.7% of all elbow fracture-dislocations in adult patients . An ipsilateral distal radius fracture occurring concomitantly with this lesion is extremely rare in adults, and only five cases with this combined injury have been described so far [2, 3, 4, 5, 6]. We present the case of a 25-year-old female patient, who sustained an anterior Monteggia (Type 1 Bado) fracture-dislocation and ipsilateral Frykman  type 1 distal radius fracture with dorsal comminution. To the best of our knowledge, this is the second case with the same injury combination, although it is the first one with excellent functional outcomes following surgical treatment of all lesions. By presenting this rare case, we want to highlight the mechanism of this combined injury, to suggest the current way of treatment of these complex cases, to appose an extended literature review with the aggregated presentation of all the existing cases worldwide and provide some risk factors for poor functional outcomes when treating such injuries. A 25-year-old woman was admitted to our emergency department after a fall from a chair onto her outstretched left hand. Due to mild alcohol consumption, communication with her was unsatisfactory. She complained of pain and inability to use her elbow, while no other injuries were found. She had a clear medical history, with no comorbidities, except smoking. Physical examination revealed swelling and “dinner fork” deformity of her left wrist, tenderness over her left elbow without any bruises or open wounds, while no obvious neurovascular injury was recognised. Frontal and lateral plain roentgenograms of her left forearm revealed a type-1 Bado Monteggia lesion accompanied with an ipsilateral type 1 Frykman distal radius fracture (Colles’ fracture) with dorsal comminution (Fig. 1, 2). Fortunately, no other fractures were found around her elbow, such as coronoid process or radial head fracture. Presence of such associated injuries compromises the final outcome. The patient was operated on within 8 h after admission, under general anesthesia and tourniquet. At the operating room, the neurological examination was repeated, but no neurological disorder was indicated. The ulna was anatomically reduced and fixed through the classical lateral approach between flexor and extensor carpi ulnaris. Osteosynthesis was performed using a dynamic compression plate (3.5 mm limited contact dynamic compression plate [LC-DCP]). Intraoperative, fluoroscopy showed a spontaneous reduction of the anteriorly dislocated radial head after the ulna’s fixation. Subsequently, through a Henry approach, the distal radius fracture was reduced and fixed with a 3.5 mm T-shaped buttress locking plate (Fig. 3). Intraoperatively, after the fixation of both fractures, the elbow was found to be stable in all directions with a full range of motion of wrist, elbow, and forearm. The post-operative course was uneventful, and our patient was discharged 2 days after surgery with a dorsal plaster splint. The cast was removed 2 weeks after surgery, and then gradually the mobilization began. The range of wrist (arc: 108°) (Fig. 4) and elbow (arc: 0–135°) (Fig. 5) motion, as well as the supination and pronation (overall arc: 175°) of the forearm recovered completely 2.5 months postoperatively (Fig. 6). Roentgenograms and clinical evaluation showed completed bone union of both fractures’ sides 3.5 months after surgery (Fig. 7, 8). The patient returned to her daily routine within 4 months following injury. At last follow-up, 6 months postoperatively, the Broberg and Morrey (98/100) and Quick Dash scores (2.27% of disability) were excellent, without any decline in motion, strength, and stability, accompanied by no pain. In 1814, Monteggia  described a traumatic fracture distinguished by a fracture of the proximal third of the ulna and an anterior dislocation of the radial head. Bado , in 1956, classified this injury as follows: Type I, anterior dislocation and anterior angulation; Type II, posterior dislocation and posterior angulation; Type III, lateral dislocation and lateral angulation; and Type IV, proximal third fracture of both bones and anterior dislocation of the radial head. In 1991, Jupiter  expanded on Bado’s Type II description of posterior Monteggia fracture-dislocation to highlight further the location and type of ulna’s fracture as well as the pattern of radial head injury. They introduced an additional four subtypes, IIA: Fracture of the ulna involves the distal olecranon and coronoid process, IIB: Diaphyseal ulnar fracture, IIC: Fracture of the ulna is distal to the coronoid process, involving the metaphyseal and diaphyseal junction, and IID: Fracture of the ulna extends from the diaphysis to the olecranon. Monteggia fracture-dislocation with ipsilateral distal radius fractures is extremely rare in adults. 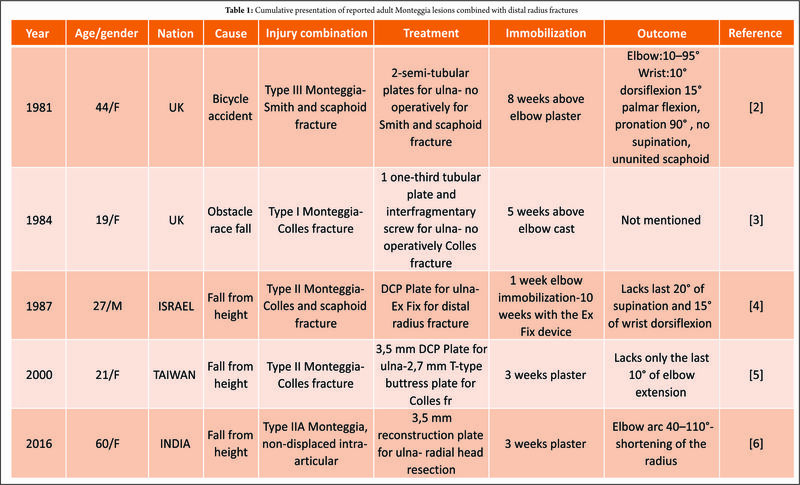 An extensive review of the literature revealed only five cases with this combination of injuries [2, 3, 4, 5, 6] (Table 1). All these injuries, including our case, were closed. Although this combination of injuries is more common in children, with many cases reports in the literature, a high index of suspicion is needed due to radiological difficulties of these patients [11, 12]. The mechanism of this combined injury is complicated, although Boyd and Boals  and Bado  are in agreement on the mechanism of Monteggia lesion. When an adult or child falls on the outstretched hand, the hand becomes locked in relation to the ground and, at the same time, a rotational force may be applied by the weight of the falling body. This force produces external rotation of the arm, thereby pronating the forearm. Bado referred to associated wrist injuries occurring in Type 1 lesions. In our case, the young woman fell backward onto the palm of her outstretched upper extremity with her forearm fully supinated, although the weight of her body caused external rotation of her arm and thereby pronation of her limb, against a locked hand on the ground. This twisting force caused the Monteggia Type 1 lesion, while the heavy compressional forces on the fully dorsiflexed wrist caused the Colles’ fracture with dorsal comminution . The radius initially fails in tension on the volar aspect, with the fracture progressing dorsally where bending forces induce compressive stresses, resulting in dorsal comminution. Type 2 Monteggia lesion is caused by falling on an outstretched hand with 120° extension of elbow and forearm pronation, while increased axial loads can theoretically produce wrist fractures . In the majority (4/5) of the existing cases, the cause of the injuries was a fall from height (Table 1) contributing to increased forces. 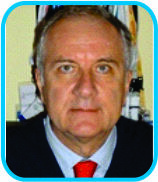 Regarding the treatment of Monteggia lesions, there is a consensus that treatment must be surgical, and this lesion needs to be treated urgently to improve outcomes. Anatomic reduction and stable fixation of the ulnar fracture are of paramount importance. Moreover, it was observed that when the reduction was not anatomic or not stable, the results were unsatisfactory . This rigid fixation can be done with 3.5 mm DCP, LC-DCP or eventually 3.5 mm reconstruction plates when the fracture line extends to the ulna’s metaphysis or olecranon. The anatomic reduction of the ulna determines the spontaneous reduction of the radial head in 93% of the cases. In the other 7%, the annular ligament prevents the closed reduction of the radial head , and an open reduction must be performed. In most cases, because of radial head dislocation, a 2–3 week period of immobilization in a neutral position is suggested. For the distal radius fracture, open reduction and internal fixation (ORIF) was reported to be associated with better functional scores in these combined injuries [5, 6] and this was shown in our case. In the first three cases, in the decade of the 1980s, the ORIF of the fracture of the ulna was accompanied with ligamentotaxis of the distal radius fracture either with external fixation or cast. However, this old-fashioned way of treatment was proved to be associated with poor functional outcomes [2, 3, 4] in these concededly complicated fracture patterns. The innovation of the low-profile locking buttress plates for distal radius fractures improved the functional scores spectacularly. The state of the art of these challenging injuries is the rigid fixation of both fractures and early mobilization. Conservative treatment or misdiagnosis is synonymous with poor functional outcomes. Monteggia fractures in adults are serious injuries to the forearm, and their treatment is still a challenge for orthopedic surgeons, especially if a distal radius fracture coexists. Effective treatment of Monteggia fracture-dislocations has been notoriously challenging in the past. Previous studies noted serious disability in such cases; however, these series were evaluated before the wide application of the plate fixation techniques that were developed by AO/ASIF and others [1, 14]. These techniques offer stable fixation and immediate mobilization, although some recent studies indicate the risk factors for poor prognosis with a high possibility for second surgery. These are Bado Type II fractures, Jupiter Type IIA fractures, radial head fractures, coronoid fractures, nerve injury, and open fractures [1, 14]. The Bado type 2 Monteggia fractures with posterior dislocation of the head can be implicated with the coronoid process or radial head fracture with or without lateral collateral ligament (LCL) rupture. In the first case, the coronoid process moves posteriorly, underneath the trochlea with lateral rotation causing posterolateral ligamentous failure accompanied with coronoid process fracture . In the second case, the lateral slope of the trochlea acts as a cam during impact, causing valgus angulation and failure of the LCL with a concomitant radial head fracture. In adults Bado Type 2 fractures are more common , and among them, Jupiter Type C and D are more rare . In contrast, Bado type 1 fracture was found to be more predominant in children . Physicians should be aware of this rare combination of lesions (Monteggia and distal radius fracture) in adults to avoid misdiagnosis and provide the best surgical intervention. Due to infrequent exposure to this type of injury, especially in adults, it can be easily missed if not specifically looked into. Taking radiograms of the whole forearm, including wrist and elbow joints, are mandatory. 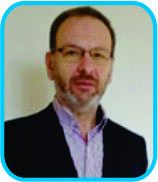 Rigid ORIF and early physiotherapy are the contemporary treatment of choice. In cases with poor prognosis patients should be informed in advance for a possible lower functional score or revision surgery. Based on the literature, these prognostic factors for poor outcome are the associated fractures, such as coronoid process and radial head fractures with LCL rupture or not, open fractures, and nerve injury [1, 14, 15]. Ipsilateral Monteggia fracture-dislocation and distal radius fracture are a very rare injury, especially in adults. High index of suspiciousness is needed for early diagnosis. Rigid fixation of both fractures is mandatory for the best clinical, functional, and radiological outcomes. Specific characteristics of these injuries are related with poor functional scores and should be recognized on time. 1. 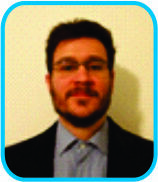 Suarez R, Barquet A, Fresco R. Epidemiology and treatment of monteggia lesion in adults: Series of 44 cases. Acta Ortop Bras 2016;24:48-51. 3. Greiss ME, Khincha HP. Adult monteggia lesion with ipsilateral wrist fracture. J R Soc Med 1984;77:1050-2. 4. Nyska M, Ziv I, Frenkel U, Zeligowski AA, Lowe J. Unusual combination of monteggia, colles’, and navicular fractures. J Orthop Trauma 1987;1:233-5. 5. Lee PC, Su JY, Yeh WL. Adult monteggia fracture with ipsilateral distal radius fracture: Case report. Chang Gung Med J 2000;23:38-42. 6. Kembhavi RS, James B. Type IIA monteggia fracture dislocation with ipsilateral distal radius fracture in adult – A rare association. J Clin Diagn Res 2016;10:RD01-3. 7. Frykman G. Fracture of the distal radius including sequelae – Shoulder-hand-finger syndrome, disturbance in the distal radio-ulnar joint and impairment of nerve function. A clinical and experimental study. Acta Orthop Scand 1967;??? :Suppl 108:3+. 8. Monteggia GB. Lussazioni Delle Ossa Delle Estremita Superiori. Instituzioni Chirurgiches. 2nd ed., Vol. 5. Milan, Italy: Maspero; 1814. p. 131-3. 9. Bado JL. The monteggia lesion. Clin Orthop Relat Res 1967;50:71-86. 10. Jupiter JB, Leibovic SJ, Ribbans W, Wilk RM. The posterior monteggia lesion. J Orthop Trauma 1991;5:395-402. 11. Singh D, Awasthi B, Padha V, Thakur S. A very rare presentation of type 1 monteggia equivalent fracture with ipsilateral fracture of distal forearm-approach with outcome: Case report. J Orthop Case Rep 2016;6:57-61. 12. Williams HL, Madhusudhan TR, Sinha A. Type III monteggia injury with ipsilateral Type II salter harris injury of the distal radius and ulna in a child: A case report. BMC Res Notes 2014;7:156. 13. Boyd HB, Boals JC. The monteggia lesion. A review of 159 cases. Clin Orthop Relat Res 1969;66:94-100. 14. Konrad GG, Kundel K, Kreuz PC, Oberst M, Sudkamp NP. Monteggia fractures in adults: Long-term results and prognostic factors. J Bone Joint Surg Br 2007;89:54-60. 15. Strauss EJ. The posterior Monteggia lesion with associated ulnohumeral instability. J Bone Jt Surg Br 2006;88-B:84-9. 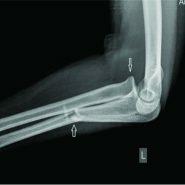 How to Cite This Article: Papaioannou I, Repantis T, Baikousis A, Korovessis P.Adult Monteggia Lesion with Ipsilateral Distal Radius Fracture: A Case Report and Review of the Literature. Journal of Orthopaedic Case Reports 2018. May- June; 8(3): 77-80.